It's night time, and I'm cycling around London's Canary Wharf, surrounded by grey, modern office blocks that fill the sky with sporadic blocks of light. A crowd is lining the street behind borders indicating I'm about to enter a Strava segment and I'm hot on the wheel of another cyclist. All sounds like the start of a depressing nightmare, right? Well, it's not, and my mental state is just fine. Instead of physically riding around the soulless bowels of the city's financial quarter, I'm actually miles away, pedalling on an indoor bike trainer with an air-conditioning unit whirring above my head. I can still see Canary Wharf in front of me, though it's all being projected through a new virtual cycling platform, Road Grand Tours. I power under a bridge, where a slope is visible on the screen, my bike moves with it and the power I need to pedal with changes. It's at this point I realise that I'm cycling in a way that feels real. For those who don't just limit their cycling to the great outdoors, propping up a bike in a stand and cranking out a training session in front of a monitor showing a route on YouTube is not a fresh concept. And neither is the idea of virtually recreating routes to sync with your bike – we've seen Zwift long lead the space, and it even recently launched an equivalent for runners. But Road Grand Tours is different. It's all these things Zwift offers plus a little bit extra. By prioritising immersion and realism, RGT gives cyclists a portal into a mixture of the sport's most well-known runs, leaving them to explore, train or race in a competitive environment as a supplement to their outdoor adventures. Set to launch over the summer, the platform is currently in beta, but very much on its way to becoming the go-to alternative for those in need of more immersive indoor cycling sessions. "I started as a developer, and when I started my own software company in Romania, I was like a lot of people – a lot of time in the office, and I gained a lot of weight," Road Grand Tours founder Alex Serban tells us. "I was fairly out of shape; I could barely make it up a flight of stairs without feeling knocked out. And my dad was actually one of the first programmers in Romania, and he's recently suffered from heart attacks and I just had this thing, you know, I didn't want to end up on that path. "I started going to the gym a lot, and I've always been a keen cyclist since I was a kid; I eventually got myself a road bike again. I think it's a very common story, but I didn't have enough time to go outside too much on it, so instead I decided to set up the big screen and an air conditioning unit. I tried everything out there – all the training software, all the video software – but as I started learning about all the cool stuff around watts and power, that's when I really started getting into thinking about how I could do something. "Zwift came out around the same time, and being involved with technology already I just naturally thought, 'How can this thing be better?' And that was it, I decided to take that concept and make it much better. That was about two and a bit years ago – I didn't know much about business, but I began working and obsessing over this idea." That idea, after plenty of coding and meticulous design work, has now developed into a platform that's ready to compete with the one that inspired it. And it shows from the moment you settle into the saddle and fire up the RGT app (Windows and Mac). Free of charge (at least for now), users can sit their computer in front of them, connect it to a TV and get riding. Realism is king with the platform, so cyclists can help propel this even further by connecting an ANT+ smart trainer (I cycled with the Wahoo Kickr Climb during our demo), as well as an ANT+ power meter. Before you jump onto one of the six courses available – the stunningly accurate ghost town of Canary Wharf, the 8bar Crit, the Stelvio Pass, Mont Ventoux, Pienza and Cap de Formentor – you'll get to pick out how your avatar looks. 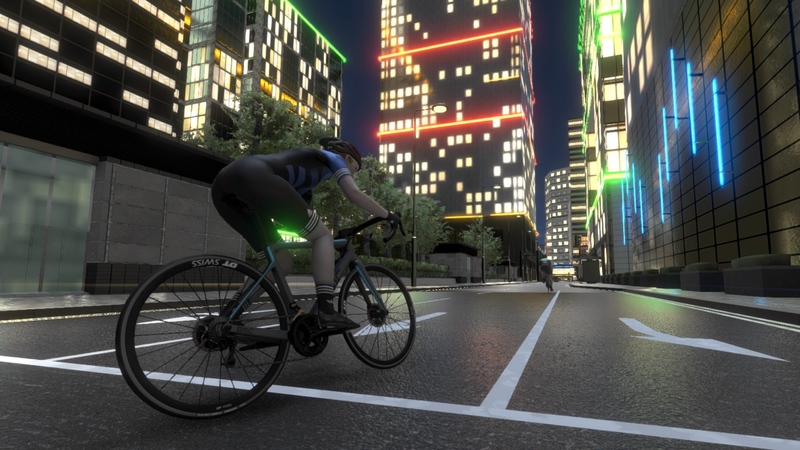 And just like in real life, what equipment you select changes your performance, with kits, bikes, glasses and helmets available from the likes of Adidas, BMC, Lazer and 8bar. It all adds to the realism – something which thankfully also extends to climbing through one of the six worlds. "We put a lot of emphasis on realism," Serban says. "We're looking to get people to really feel like they're climbing a mountain, or competing in a race. That means the graphics have to feel pretty real, and the interface doesn't get in the way. The physics also have to be very lifelike – we have the avatar reacting to drafting and the way people move around each other, kind of like the real peloton dynamics. If you're faster than someone, you'll automatically cycle around them, for example. And if you're flying down a hill, you'll feel that on the pedals. "I'm not saying our stuff is perfect, but we do view the little things that aren't realistic as little slaps across the face that wake you up from the immersion. And though we're in beta, we're always trying to improve things." Our demo involved the graphics being cranked to the max, though this can be customised – like pretty much everything in Road Grand Tours – to match the performance power of your laptop. You can even sync things up to an Oculus Rift, if you fancy a sweaty spin in the most immersive way possible. And, just as when you're cycling through a park or oft-frequented trail, Strava segments are dotted throughout the experience to help provide a competitive edge. Road Grand Tours appears well on its way to offering genuine competition to Zwift and others, but it takes more than just fancy graphics and a realistic experience to steal the virtual cycling crown. So much of what makes RGT's rivals successful are the communities which fill up the virtual routes. And bringing people into the impressive world it's created is perhaps the biggest challenge Road Grand Tours initially faces. Otherwise, the six courses risk becoming empty, and that kills the competitive aspect that's crucial to the wider concept – nobody wants to compete in races or battle for Strava supremacy against 28 other people worldwide. The fact that the platform is free should give it a huge boost during this beta stage and into its official launch. But even if Road Grand Tours does manage to cement itself as the indoor training platform, it still won't beat the feeling of being outdoors, says Serban. "My belief is that nobody likes being inside – people want to be outside and people want to be on the Stelvio Pass or the Vontour," he told us. "But obviously we can't all go to these amazing places. Really, we're not saying it's a replacement to being out there on the bike, but we think it's the best possible complement." Whether Serban and the team are able to fulfil this aim remains to be seen, but one thing is certain: Road Grand Tours is ready to make a sprint at the summit of the space. Let's just hope I don't end up with actual dreams involving Canary Wharf after excessive spins around its virtual equivalent.